You need to understand your boss and what they expect from you when you communicate. You don't have to be nervous if you keep these ten simple ideas in mind. Improving Communication with authority figures make many people nervous. Your boss holds the power over your performance reviews, salary reviews, and future work assignments. Don’t be intimidated by all that authority. Communication with your boss or any of your business communications can be improved. You just need to understand your boss and what they expect from you when you do communicate. Your boss doesn’t like surprises. If something bad has happened, its better they find out from you now than from someone else later. If you want a better boss, and better communication with your boss, then keep them informed. It’s important to keep your boss updated on your progress, good and bad news, and what you might need help with in the future. If you are struggling with an assignment or have finished early, let the boss know (see point 1). Opinions are not what the boss needs. Management has a lot of their own opinions and if they want yours they will ask for them. What management needs is unarguable objective evidence. Subjective information will only weaken your argument and weaken communication with your boss. Think about what questions your boss may ask you and make sure you have researched the answers. Not having the answers available when you are talking to your boss is wasting their time (see point 5). Keep updates short and to the point. Explain the “bottom line”. If you need something, be specific. Saying “I need help” is undefined. Instead say “I need [specific person’s name] help for 4 hours on this project.” The boss likes to make informed decisions and quick calculations of the impact. Increasing communication with your boss will increase your productivity and your boss’s productivity. Once the boss has said yes, stop talking and say thank you. If you keep explaining the reasons why, your boss may discover that your reasoning is faulty and take back the resource they just gave you. After all, you got what you wanted so leave happy! We all have problems. Your boss has big problems. You do not want to add to their problems, do you? Instead, offer your solution. Support your solution with the facts and how the problem is solved with your resource request. You may not understand it but your boss has a lot of different pressures to work under. Your proposal may be the best solution given the information you have but the boss has additional information or political battles to fight that do not have to be explained to you right now. If you understand during communication with your boss, it will help you see it from their perspective. You may not like it but there is some truth somewhere in the feedback you call criticism. Use the feedback to devise solutions and not to offer excuses. Even if you think you are in the right, your message is not getting communicated to the boss clearly. Fix the communication and turn the criticism into corrective action. All feedback is good feedback so use it to improve your performance. Going over your boss’s head to their boss can be dangerous. Learn to pick your battles, observe the other nine communications points listed above, and be prepared for unintended consequences. If you feel you must go over their head, then make sure you inform your boss of what you are doing (see point 1 above). Communicating with authority figures can be a lot easier if you plan ahead and consider it from their point of view. Effective communication with your boss can be very beneficial. 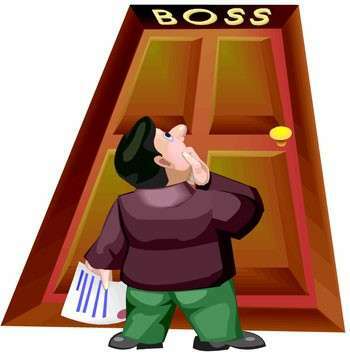 Do you know anyone that has a boss? Then pass this article along to them so they can benefit too.